So, farewell it is to the City of Setagaya and all the good friends/colleagues we’ve met on our recent Rice adventures in Tokyo. Particular thanks to our performer-translators KAKUMOTO Atsushi and Sumida San, to director Masayoshi, to Akahisa/Kana/Romi and the technical crew for ensuring the smooth-running of the show and ultimately what might pass for the swiftest get-out in Rice Show history. The locals (this means anyone who can get home in less than 2 hours) gave generously of their time to help us navigate through the beguiling intensity of Tokyo life; showing us fine restaurants with extraordinary edibles. For our final evening in Tokyo, Craig and I travelled to the Tama Art University with producer/lecturer OKUYAMA Midori where we instructed her students in the art of ‘getting away with doing what you love doing’. Then it was back to everybody’s favourite meeting place, the dog Hachiko, in Shibuya, followed by more fanciful foods including chewy fish gills on tofu and pop-on-the-tongue delicacy sea grapes. Tokyo is rammed full of eating houses, often tucked away in alleys or basements and sadly I think I’d struggle to re-find any of the brilliant places we were taken to. The remaining hours were spent drinking with the Blue Man team and it gets a bit hazy in the memory…we didn’t do Karaoke nor did I get to bed before it was time for the airport pick-up. Trying to use a long-haul flight as recovery time is never a good idea, as I’ve previously found to my detriment… but there was time for another treat in store. At the Gate I bumped into old friend Nigel Cliffe, on his way home with the Royal Opera House after a 3-week stint in Tokyo. Nige was part of team for the original production of Vesalius – a Requiem (1996-8) and also sang basso in solitary (1998-9). If I was mindful of the cost and practicalities of transporting Stan’s Cafe to Tokyo, I needn’t have been so worried. The ROH had a team of 250 people out there! So many, infact, that they couldn’t get them all on one plane (…or maybe that’s for reasons of insurance). It seems Japan has a great appetite for British Culture and the Arts is a succesful export to that land. The youth culture clearly references a British equivalent with freeform borrowing and re-invention. 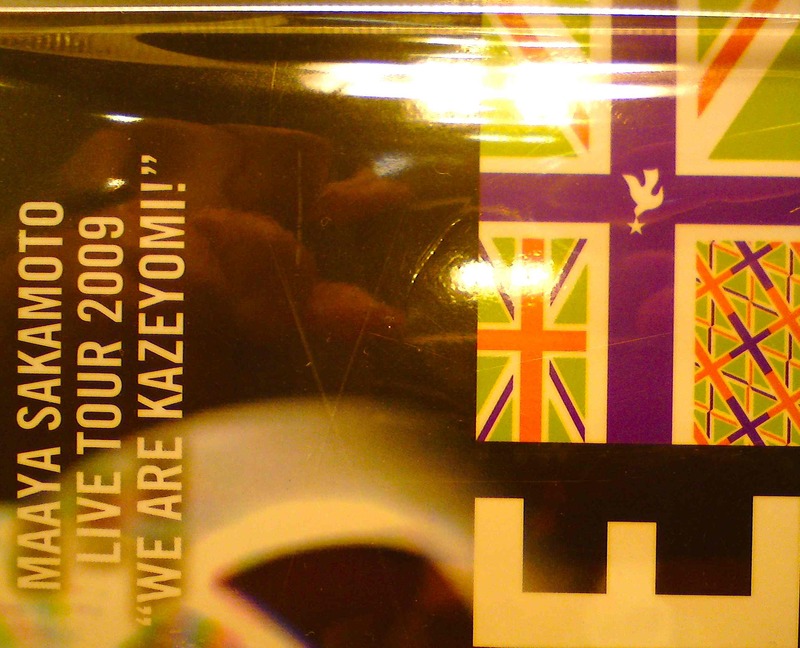 I was amazed at the number of Union Flag images that were displayed – on clothing, bags, posters – but moreover, impressed with the way the Japanese have adopted it as a design motif and have riffed on it. Maybe it’s because the liberal culturati back home tend to reject the vocabulary of nationalism these days or maybe it’s because Britpop and Punk still hold their currency amongst the Japanese youth, long after it has waned back home? I looked for similar takes on the Stars & Stripes but found none. A second observation on the visual culture of the streets in Japan concerns the prevalence of small furry cartoon creatures, often of indistinct species. Images of baby pets are everywhere. They’re on adverts, on public information notices, on lamp-posts, on ticket machines. As you enter the subway at Shibuya you hear a recording of birdsong. You see cutely dressed miniature dogs being wheeled around in specially designed buggies. You see shops selling dog and cat outfits – dog scarves, dog dresses, even dog lingerie! Japanese life may be highly ordered – some might say repressed – but I was struck with how safe it feels there. Amidst the busyness and mayhem there is a peacefulness. Nothing threatening or edgy to my mind. The only words of anger I heard turned out to be a European couple having an argument (in English, of course) on the street. So, the correlation I’m trying to draw here is this; pervasive imagery of soft, cute, furry creature makes for peaceful, calm persons. Charlotte and I pounded the superheated streets from the Tsukiji Fish Market, through Ginza, past the Imperial Palace to the Diet (Parliament) Building, where we encountered about 8 police riot buses parked up. 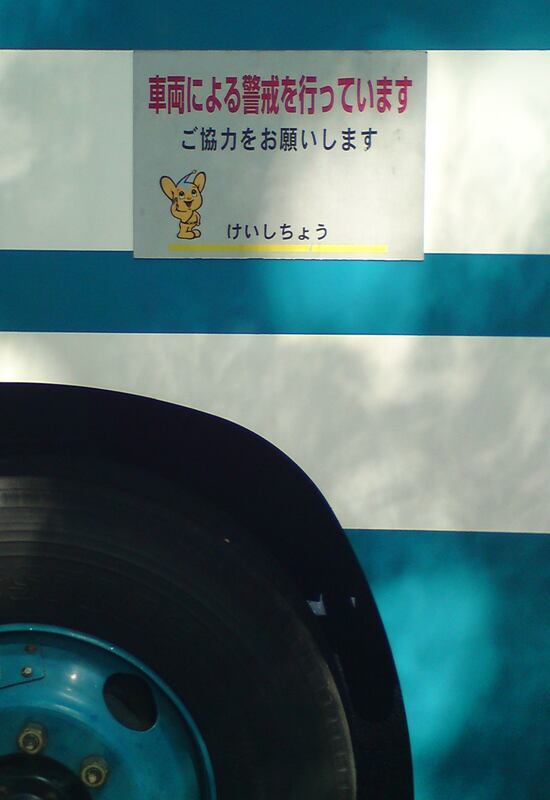 Each of them had a notice fixed to the passenger entrance – replete with cute furry animal. I may have to give the Pokemon phenomenon a second glance after all, if only to see if it sheds some light on this theory. If I travel to a new City I find the best way of understand it is by getting out of it in order to revisit it. Getting out of Tokyo was nigh impossible as it seems to extend endlessly in all directions (including re-claimed land in the sea). Nonetheless I will attempt a leftfield response under the persona of Harry Juku, Taste of Tokyo – a contribution to ARC’s Bawdyville next weds – which I’ll be performing with Kindle Emily. For now, though, I am in Orleans, France – driving to the Domaine d’O, Montpellier with The Black Maze. A bientot, mon Blog.